Diplomats, actors, and thousands of individuals on Twitter have bound together in solidarity after recent terrorist attacks left 17 dead across France. "Je Suis Charlie," a phrase and hashtag (#JeSuisCharlie) is the uniting battle cry for human beings that support freedom of the press and despise acts of violence. For those unfamiliar with the recent attacks, French satirical magazine Charlie Hebdo was targeted by terrorists due to their controversial depictions of the Prophet Mohammed, although Charlie Hebdo does have a history of taking down public figures, politicians, and religious figures of all faiths. "Je Suis Charlie" even permeated the red carpet of the Golden Globes. Notable supporters, such as Amal Clooney (née Alamuddin; a noted esquire in International Law and Human Rights) and Helen Mirren (both pictured) took the opportunity to raise awareness about the devastating terrorist attacks that rocked France. Whether it be via sign or by a pin (such as the one pictured on Amal's purse), the international community stood together in protest of the atrocities that occurred in France. There was no such outpouring of support for the enormity of cruelty that is occurring in Nigeria. CNN reported that on Saturday, a mere day before the Golden Globe awards, explosives strapped to a young girl exploded in Nigeria, killing about 20 people. The weekend before the terrorist attack on Charlie Hebdo, members of Boko Haram, a militant terrorist group, killed as many 2,000 people in Northern Nigeria. 16 villages were effected by Boko Haram's terrorist attack and at least 30,000 people have been displaced. Boko Haram is the same militant group that claimed responsibility for the abduction of more than 200 schoolgirls in April of 2014. Boko Haram has also been terrorizing Nigeria since 2009, attacking schools, churches, civilians, and government buildings. Boko Haram shows no regard for human life. In 2014, Boko Haram killed an estimated 10,000 people. 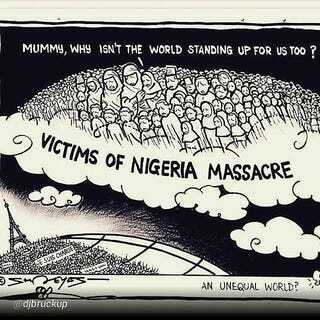 That being said, there were no signs crying for justice for the people of Nigeria at the Golden Globes. No images of world leaders, marching through the streets, standing shoulder to shoulder grace the internet. The White House said that they should have done more in regards to showing solidarity in Paris, as no top-tier official was present at the anti-terrorism march that was held on Sunday. On Monday, White House spokesperson Josh Earnest solemnly stated: "We should have sent someone with a higher profile." If the United States made a feeble attempt to support France, arguably the United States' oldest ally, what hope does Nigeria have? "There's a sense that 'That's Africa, bad things happen. This is Paris, it's a Western country. This shouldn't happen'....We're conditioned by years of reports coming out of Africa to expect this type of thing in Africa." There is no monopoly on human suffering. All human lives matter. The global media should reflect that. The United States Government should reflect that.